The effects of the online revolution are being felt far beyond Silicon Valley as consumers and businesses shift buying patterns to take advantage of the convenience and cost savings that are available over the Web. The term "HyperWars" describes the constant battle for survival of the fittest that reflects the reality of business today. Managers who want to stay afloat need practical guidance -- and fast. Drawing on extensive research and his pioneering experience in e-commerce, industry innovator Bruce Judson outlines eleven strategies for thriving in this hypercompetitive environment. His visionary techniques, from "Create the 'Total Solution' for Your Customer" to "The Magic in 'Free,'" are illustrated with examples of Internet initiatives that real companies, from pool suppliers to major businesses like Chrysler, are implementing today. HyperWars explains how the Internet can and must be incorporated into all aspects of a business, to do everything from cutting procurement, marketing, and communication costs, to deepening customer relationships. Here are the tools every reader needs to survive and profit in the new competitive era. At Time Warner in the mid-1990s, I became one of the early Internet pioneers, working as a leader of the team that created one of the first large-scale commercial Internet sites. From that time, my work has kept me in the midst of a swirl of Internet development, and my experiences, both positive and negative, have now spanned the full spectrum of online activities: I was the cofounder of Time Warner's Pathfinder, which, despite its critics, is now one of the highest traffic Internet sites in the world; I was involved in the start of Road Runner, the high-speed cable Internet access service; I served on the board of directors of one of the leading Internet commerce companies, Open Market, Inc.; I have been extensively involved with a variety of Internet technology companies; and I wrote the best-selling book NetMarketing, which was one of the first books to discuss the business potential of the Internet. I have also launched one of the first paid online newsletters, Bruce Judson's Grow Your Profits, which details how businesses can use the Internet to save money, save time, and profitably grow their revenues. How will my business or industry be changed? Will I still have a business? This book is written to provide practical answers to these questions. I would also like to note that this is not a book about the Internet. It is book about business, written by a businessperson for businesspeople. As the Internet is rapidly redirecting the currents of all businesses, this book is a nautical chart for navigating the potentially difficult waters ahead. My perspective on how the Internet will affect businesses is shaped by my involvement in its early and ongoing commercialization. At this point, I feel that the Internet has already matured through several different phases, each of which has launched the need for a new business battle plan. The end result is that companies have forever been changed because of the new types of competitive dynamics at play. Now, the stakes are even higher because the Internet has become accessible to more and more people, making an ever-increasing number of businesses and individuals dependent on the Web. in the Time Inc. boardroom. We were discussing how Netscape planned to build its business and what type of role Time Warner might play in it. Clark paused for a moment and then looked at me and said, "It's confidential, but tomorrow we are going to release the first version of our browser for free to everyone on the Internet." I looked up in surprise and immediately responded: "But then how will you create a moneymaking business?" He smiled somewhat enigmatically and after a pause said, "I'm sure we'll find a way." The immediate implications of Netscape's actions were clear. First, it meant that millions of people would have access to a powerful new browser, thereby ensuring that use of the Internet would explode. Second, Netscape's decision to use "free" to almost instantly build a customer base of millions of people had the potential of forever changing the nature of competition. The second watershed event occurred during a trip to San Francisco in 1996. Late in the day, a friend, who was a partner at a large venture capital firm, called me and said, "There's something highly confidential we want to show you. Time Warner might want to be involved. The only time we can do it is at nine P.M., but it's worth it. Can you make it?" That night I was driven down multiple dark roads, only somewhat facetiously wondering if I would soon be blindfolded for extra security. Ultimately, we stopped at a nondescript building and went inside the door of a company named Artemis Research, where I was introduced to Steve Perlman, the CEO of the company. His first words to me were "The real name of our company is Web TV." Perlman's fanatical approach to secrecy was telling as well. Later in this book, I discuss the value of speed. It's clear that Steve felt coming to market first was so important that he didn't want anyone else to know what he and his team were doing in the event potential competitors might then accelerate their work or steal the publicity -- valuable for sales momentum -- if they had developments of their own. The third watershed event, and yet another phase in the development of the Internet as a potent business force, occurred when America Online went offline for nineteen hours in August 1996. Businesses across the United States were affected by the loss of e-mail; progress of the "repair" was covered by radio and television almost moment by moment; and it was front-page news. I subsequently shared a speaking panel on the West Coast with Ted Leonsis, the president of AOL Studios, and Halsey Minor, the CEO and founder of CNET. Stewart Alsop, a well-known technology journalist and Fortune columnist, was the moderator. At some point, Alsop was asking what each of us believed was important for the future, and Leonsis looked at me and jokingly said, "Who would care if you [a Time Warner media site] went down for a day?" His message: The e-mail service provided by AOL had become such an integral part of the business environment that its failure, rather than a mere disappointment to those seeking information or entertainment, was a major event. It was a short jump from regular e-mail use to daily Web visits. I knew then that the Web was itself about to become a central business tool. The fourth watershed event occurred at home, when it became crystal clear to me that the Web was going to be an important player in the future of retailing. One day my seven-year-old daughter was baffled by why she couldn't find Pleasant Company's American Girl catalog (now a division of Mattel) online. Though the company has a great Web site, when she hit the button for the catalog, she kept receiving information about how to have it sent to her by mail. After twenty minutes of searching the Web site, she asked for my help. "I don't think it's online," I told her. "I think you have to send away for it or call the company." "That's stupid" was her unequivocal reply, more blatant than a high-priced consultant but just as accurate. The younger generation has already reversed the order of things: To her, if you want something, you look for it by going online. Ironically, in his best-selling book Burn Rate, Michael Wolff describes our efforts in launching Time Warner's Pathfinder (the first Web site from a major media company) as the single most important "event that got the business started, that precipitated the onslaught." Our launch was, according to Wolff, "the Internet equivalent of the assassination of Archduke Ferdinand," which led to World War I. For me, this was a major public event, but my thinking was shaped by the more private encounters discussed above. Part I of this book is my analysis of the rapid growth of the use of the Internet as a business medium and the implications of this growth for businesses of all sizes. Of necessity, this part of the book is a combination of three things: (1) a discussion of what is already happening, (2) a look at the dynamics that underlie this evolution to date, and (3) a discussion of the challenges for the business world based on this understanding of the underlying forces at work. Like all major changes, the widespread adoption of the Internet creates a combination of opportunities and threats for established businesses. First, I have looked at what leading-edge companies are doing today. There is almost always something valuable to be gleaned by looking at specific examples of how successful companies -- both large and small -- are embracing the present and gearing up for the future. Second, I have looked at existing management theory and its practical applications. My overriding focus in looking at prevailing management wisdom has been to hold it up to a new light, look at it through the lens of the Internet-contoured business world, and ask: "Do these ideas still provide businesspeople with valuable guidance? If so, do they need to be modified to lead to success in our emerging competitive environment?" Third, using the analyses developed in the first part of the book, I have developed new, highly practical ideas about what businesses need to do today in order to survive and prosper tomorrow. Part III of the book describes my personal view of the ongoing future development of the Internet. This perspective is included as an additional guide to assist you in the rapidly changing business climate. Finally, Part IV, The HyperWars Audit, is designed as an easy-to-use straightforward means for you to evaluate the battle readiness of your company. Here is what I want you to take away from HyperWars: a new and deeper understanding of how the Internet is fundamentally changing the nature of business and why, so that you'll be in a better position to think about how to make choices for your own business, whether it's large or small. It is also my goal that this book leave you with a number of practical ideas for ways you can improve your business immediately. In college, I studied with a professor who constantly said, "Always remember that deciding to do nothing is also an active decision." As Internet businesses have grown and branched out into multiple industries, my personal conviction is that in almost all situations, actions that promote changes are required if existing businesses are to survive and maintain their prosperity. I urge you not to decide to do nothing. 1. Do you agree that the Internet inherently puts tremendous price pressure on retailers and manufacturers? 2. Do you agree that the Internet inherently leads to consolidation among industry participants? 3. What kinds of practical steps can your business take to survive? 4. Do you believe the Internet dramatically increases the value of being first to market? 5. How do you think the growth of the Internet will affect the pricing of your products and services over the long term? Do you think we will see the same product with prices that fluctuate rapidly (both up and down) over time? 6. What businesses will not be changed by the rapid growth of the Web? 7. What kinds of new business opportunities do you think the rapid growth of the Web is creating? Bruce Judson, author of NetMarketing, was named one of the nation's leading interactive marketers by Advertising Age. He is the president of the Judson Group, a private consulting firm specializing in Internet business. 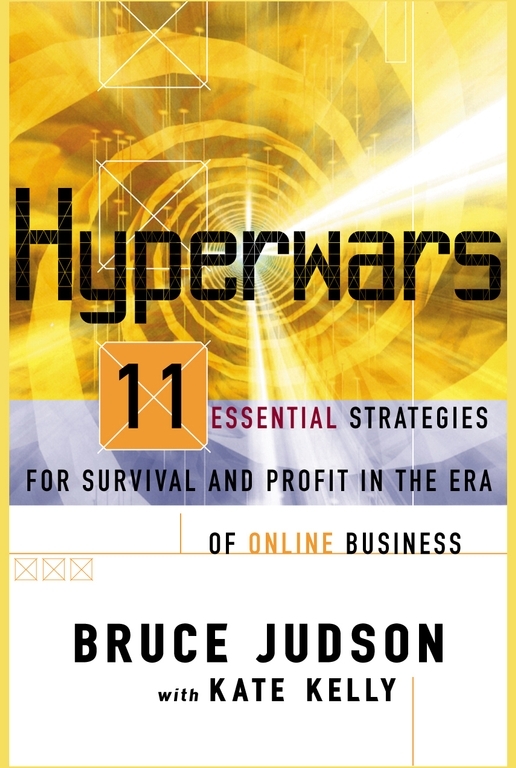 Michael Wolff author of Burn Rate Judson has a remarkable ability to separate the hype from reality: HyperWars is a rare combination of an insightful explanation of what is happening today and highly useful lessons for business survival.